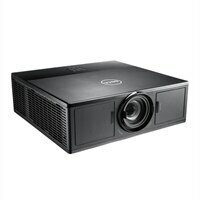 Powerful, high-brightness projector with lamp-free laser technology built for presentations in mid-size to large rooms. Lose the lamp: Lamp-free lasers provide continuous operation at a bright 5,400 lumens, for beautiful projection even in less-than-ideal light. Easy connectivity: Take advantage of multiple wireless connectivity solutions. You can centralize presentations through LAN display and project from any compatible smart phones and tablets. Plan on a long life: With no lamps to replace and 20,000 hours of laser life, you’ll need little IT or facilities maintenance.